Nicou (Sion, Switzerland) on 31 January 2019 in Landscape & Rural and Portfolio. Oh la fraîche carte postale ! Très beau vilage enneigé. Comme une carte de bonne année! Très beau village parfaitement capté. Elle est magnifique cette photo! Superbe atmosphère hivernale très bien rendue! Belle journée Nicou! quel beau coin ! bravo ! un écrin qui fait rêver bravo ! wow..fantastic shot !!! Must be wonderful living here !!!!! Digne d'une carte postale ... Bravo. 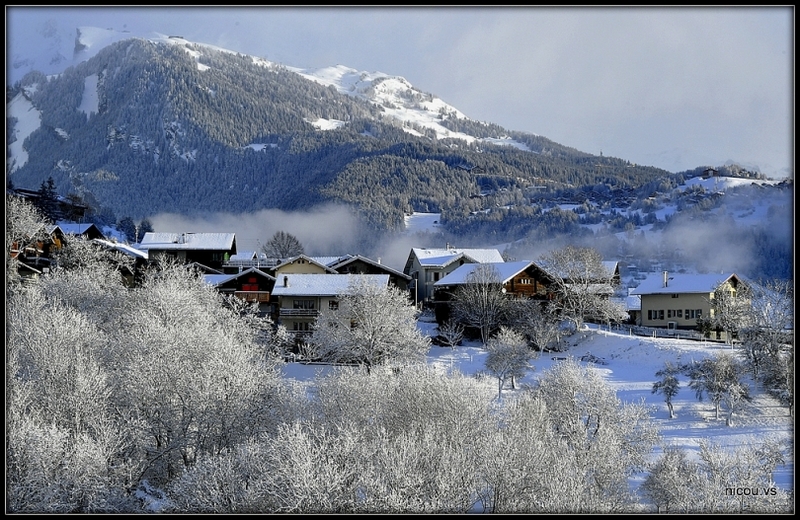 A beautiful winterscape image of this village! The mountain makes a great backdrop. What a beautiful view of this village. A fine winter scene so nicely captured. Excellent. This is fantastic a great composition. A very appealing image of the frozen village. A wonderfully calming photo, nice to watch. Beautiful scene. It looks cold. I'm glad you were out with your camera. Wow.... What a nice picture postcard. Great!! Wonderfully bright despite the low clouds! Beautifully situated village and wonderful winter scene. What a beautiful winter scene of this snow covered village. Wonderful composition and lovely light.